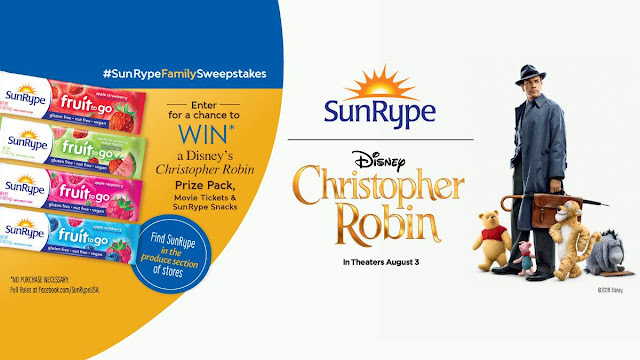 SunRype is celebrating the new Christopher Robin movie by giving away awesome Disney’s Christopher Robin prize packages every single week! Grand Prizes(4): (i) Petunia Pickle Bottom Winnie the Pooh and Friends backpack (valued at $189.95 USD); (ii) 4 Fandango movie admission codes to see Disney’s Christopher Robin (the “Picture”) (maximum retail value for 4 movie admissions: $60.00 USD); and (iii) a package consisting of a digital code to download the Picture’s soundtrack – ARV $15.99 USD, a cap - ARV $20.00 USD, a picnic blanket - ARV $40.00 USD, a honey pot mug – ARV $12.99 USD, a poster - ARV $10.00USD and a variety of SunRype snacks valued at approximately $30.00 USD (“Grand Prize”). Total approximate retail value (“ARV”) of each Grand Prize is $378.93 USD. First Prizes(20): (i) 4 Fandango movie admission codes to see the Picture (maximum retail value for four (4) movie admissions: $60.00 USD); and (ii) a package consisting of a digital code to download the Picture’s soundtrack – ARV $15.99 USD, a cap - ARV $20.00 USD, a picnic blanket - ARV $40.00 USD, a honey pot mug – ARV $12.99 USD and $10.00 worth of FREE product vouchers or product equivalent SunRype snack samples valued at approximately $10.00 USD (“First Prize”). Total ARV of each First Prize is which $158.98 USD. This Sweepstakes ends on 08/28/18 and you can ENTER EVERY 24 HOURS to win.